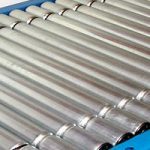 LVP Conveyor Systems Ltd. offer the industry standard for Powered Roller Conveyors (Lineshaft) which is available from light duty to medium/heavy duty. 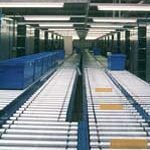 For faster applications we offer a high speed belt under roller conveyors capable of running at speeds of up to 100 metres per minute. 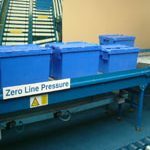 For a more intelligent approach and energy saving system, LVP Conveyor Systems Ltd. offer a 24 volt Zero Line Pressure Roller Conveyor. 35 mm Ø Rollers are utilised to provide 4Kg Drive Per roller. Load/drive based on 37.5mm pitch Standard widths 300mm – 750mm. Providing upto 36 metres in length from one 0.37Kw drive unit. Supplied in fully assembled conveyor modules. Maximum module lengths supplied – 3000mm Suitable for conveying very small products with lengths as small as 100mm. 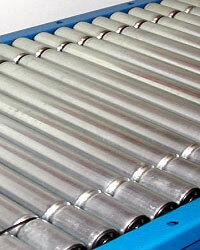 25.4 mm Diameter Rollers With 35mm Sleeves are incorporated providing a drive of 4kg roller. Standard widths 300mm – 750mm. Speeds up to 36 metres utilising a single 0.37Kw drive unit. Suitable for conveying very small products with lengths as small as 100mm. Maximum module length 3000mm Available in stainless steel. 50 mm Diameter Rollers are incorporated to provide 8Kg Drive Per roller. Supplied In maximum 3.0 Metre Lengths As Standard. Shorter lengths are available Simple & Modular Design. Powder Coated Finish: Blue RAL 5010 or White RAL 9010. Bright Zinc Plated Rollers are standard. 50 mm Diameter Rollers are incorporated providing 12-20Kg Drive Per roller. Shorter straights are available Simple and Modular Design. Standard Widths available 362mm – 1012mm. Bright Zinc Plated Rollers only. Individually Driven zones powered by 1 x 24 volt Motorised Rollers, slave driving standard gravity rollers. Maximum Zone Length Of 900mm. Available in 75mm, 100mm or 150mm pitch. Energy Efficient and low noise operation. 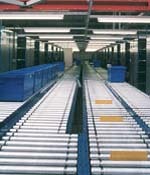 Conveyor Widths from 312mm to 1012mm. 90, 60, 45 and 30 Degree Bends Available. Powered By 24 Volt DC Brushless Motor. Accumulation with Zero Line Pressure. Existing Systems can easily be modified and retro fitting also. 50mm Ø Rollers utilised to provide 8Kg. drive per roller. Load / Drive ration based on 60mm pitch Widths from 412 – 1012mm. Suitable for conveying products at high speeds up to 100mpm. 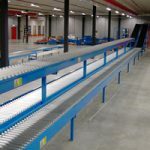 To compliment the range of powered roller conveyors, there are additional ancillaries which are available to make optimise the potential of each system. 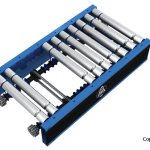 All the ancillaries fit into the modular system of the powered roller conveyors. 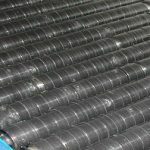 All rollers within Bends include standard rollers with a plastic taper sleeved over main roller. All drive belts are Heavy Duty Belts throughout. Effective Standard Widths available are 362mm to 1012 mm. The range of bends available in this range include 30, 45, 60 & 90 Degree Angles. Product orientation and positioning is important and true Tapered Rollers are fitted to ensure this. Only Available with Light Duty 30 & Medium Duty 60. We advise against accumulation on this unit. Timing Belt Tension is ensured by incorporating a tensioning unit which is screwed for adjustment. Removable Guarding ensure moving parts are fully enclosed. Powder Coated Finish Frame: Blue RAL 5010 or White RAL 9010. Speed Ratios available 1:1 2:1 Ratio gained by using Speed-Up Spools. 900mm Clear Access is provided using this standard Gate module. For ease of movement of lift it is Spring Assisted. This module should not Be Fitted Directly To Bend Section. Available In 362 to 762 Widths. Powder Coated Frame Finish: Blue RAL 5010 or White RAL 9010. Standard Support Stands & Braked swivel castors as standard All standard Widths are available. Powder Coated Frame : Blue RAL 5010 or White RAL 9010. Used in conjunction with Medium Duty 60 Conveyors Only. Advised Maximum angle of incline – 5 Degrees. 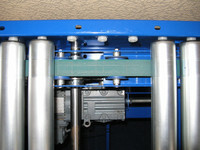 To Prevent product dipping in on rollers, intermediate rollers are recommended to be used in conjunction with main unit. Option with Left or Right Hand merges. 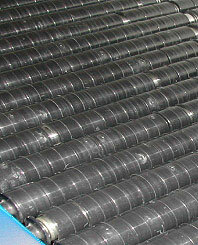 Conveyor Widths available : 362 – 762mm. To provide additional stability intermediate rollers can be incorporated. Provided with option of either Manually or Pneumatically operated. Available in either Left or Right Hand switch. Supplied with Bright Zinc Plated rollers as standard. Bright Zinc Plated Rollers provided as standard. Designed to be fitted into Straight Track. Pneumatics supplied which feature flow regulators fitted to Double Acting Pneumatic Air Cylinder – included. For Light Duty 30, a single Roller Will Be Removed At The Stop Position to accommodate the blade stop. Powder Coated Finish: Yellow RAL 1021.
his product is available in Stainless Steel. Medium Duty 60 Includes One Single Acting Spring Return Pneumatic Air Cylinder With Flow Regulator. Heavy Duty 90 Includes Two Single Acting Spring Return Pneumatic Air Cylinders With Flow Regulators. Additional 10 Split Type Speed Up Spools supplied FOC. To be fitted on site. These units are Designed To be incorporated into Straight Track. 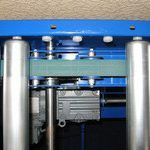 Friction Pad is pneumatically operated to stop The Rollers. Gives A Negative Line Pressure Includes Two Pneumatic Thrusters. 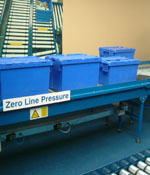 For use with Light Duty 30, Medium Duty 60 and Heavy Duty 90 Conveyors. 200mm by 200mm – Minimum Product Size 45 Degree Switching Angle. Pneumatic Operation Recommend Use With a 45 Degree Mitre Section. Powder Coated Frame Finish:Blue RAL 5010 or White RAL 9010. Chain Transfers available with either 2 or 3 strand chains. Options on chain type – either Steel Or Polysteel Can be supplied as a Double Width Unit. Standard supply includes the pneumatics with flow regulators fitted to the Double Acting Pneumatic Air Cylinders. Powder Coated Finish Blue RAL 5010 or White RAL 9010. Suitable For Moving Loads Of 25Kg. For Heavier Loads Please Contact Us. Standard Frame Finish: Powder Coated Blue RAL 5010 or White RAL 9010. Other Colours available. Stainless Steel Available on all Products. Loads can guided to any side of the conveyor using angles rollers. Each Unit Includes Plastic Wheel Side Guide One Side Only. Bright Zinc Plated rollers as standard. 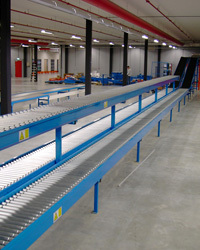 The module uses a nudge bar located on the side of the frame and to assist the turning the roller section runs faster than the preceding section. Turns Loads Through 90 Degrees. Each Unit Includes Plastic Wheel Side Guide One Side Only.